A talk at Hove Gardening Club about a fairytale house on a hill, surrounded by perhaps the finest chalk gardens in the country, inspired me to travel straight towards Worthing to explore. The distinctive house, Highdown Towers, was constructed in 1820 to the west of Goring, 100ft above sea level. It is reached via a long straight driveway to the north of the Littlehampton Road. It was the home of Sir Frederick and Lady Stern, who were responsible for transforming the disused chalk quarry above the house into a packed network of winding walks and light-filled clearings. The white chalk cliffs of the quarry are now barely visible behind luscious green trees and shrubs everywhere. Frederick Stern’s work on the gardens began in 1909 and intensified at the point of his marriage in 1919. Some of the great collectors of the day brought back seeds and plants from as far afield as the Himalayas and Borneo. Much was experimentation to see which plants worked best in this demanding chalky, and windswept, spot. Sir Frederick received his knighthood in 1956 for, unsurprisingly, services to horticulture. Upon his death in 1967, Lady Stern donated the house and gardens to Worthing Borough Council which took over the gardens the following year. From 1991-98, the house served as a nightclub called Sterns and, later, the Mansion House. The story goes that the council gave permission for the enterprise thinking that it was to be some sort of country club. They couldn’t have been more wrong – some of the raves finished at 6am. Highdown Towers features two storeys, though there are two notable exceptions. 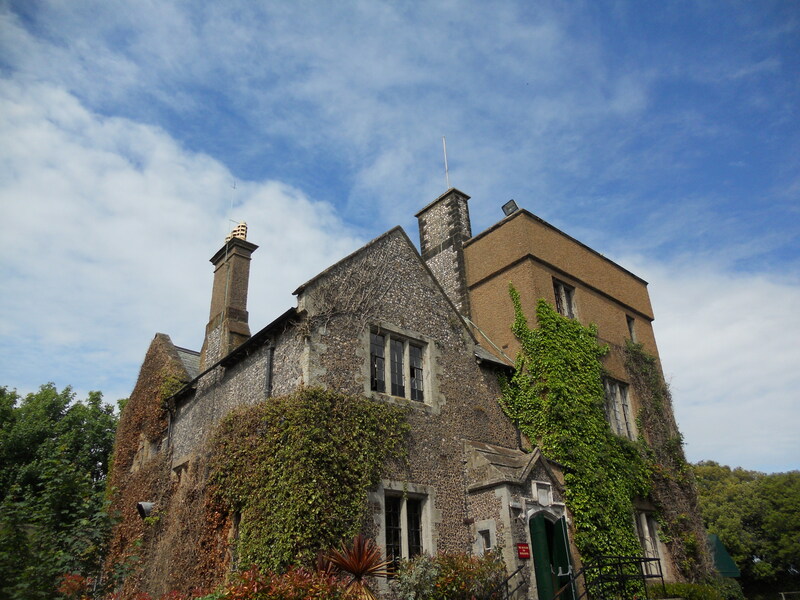 First, as the name of the house suggests, the building incorporates a tower. The pebbledashed extrusion, which stands out from the rest of the knapped flint structure, incorporates an extra storey. Second, the house is today known as the Highdown Hotel and offers 16 bedrooms with conference facilities. I wasn’t expecting though, whilst exploring a curious set of unwelcoming steps leading into the ground in front of the house, to find the hotel’s largest conference room hidden within a secret level below the house’s lawn. The steps were some sort of fire exit. 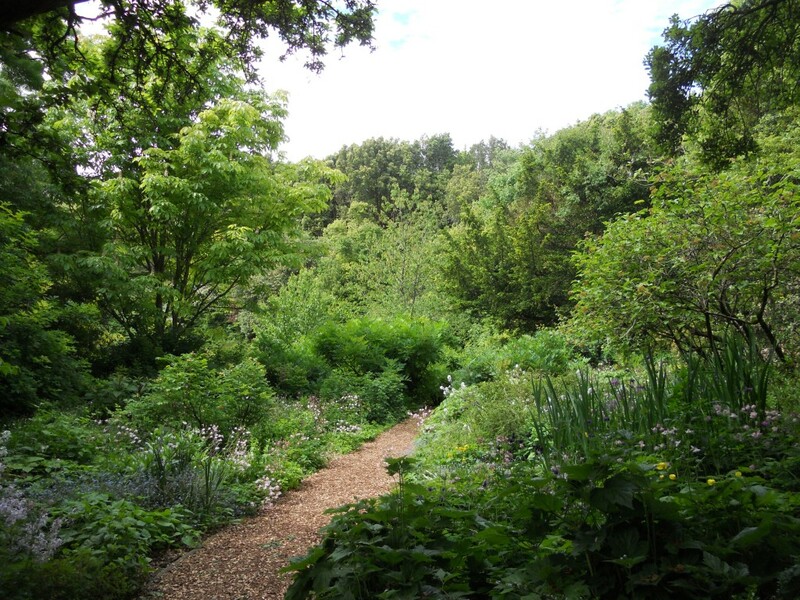 Highdown Gardens are free to enter and include a number of breathtaking examples of rare trees (such as the constantly peeling Paper Bark Maple), colourful shrubs, climbing roses and – my favourite bit – rock pools with an adjoining cave.